Control Cable is an ISO 9001:2008-certified manufacturer with over 30 years of experience in providing the highest quality custom cable assemblies, wire harnesses and electro-mechanical assemblies as well as custom made cables. Our customers range from OEMs, small businesses, and mid-size companies, to Government agencies and Fortune 500 companies. 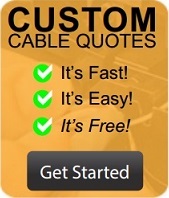 In addition, Control Cable has leveraged relationships with our vendors, so we can offer clear price advantages on many related products to our customers. We have become experts on premises wiring for just about any type of network, phone system or terminal application. Control Cable, Inc. (CCi), founded in 1975, is one of the industry's leading providers of custom cable assemblies as well as custom voice and data infrastructure solutions for the government, military and commercial sectors. Located in Baltimore, Control Cable is a short distance from our Nation's Capitol and is a privately held, veteran-owned small business. We are a well-established, mature company with a solid understanding of the requirements of markets in which we serve. We take great pride in having a staff with an average tenure of over 10 years which allows for a smooth-running and highly competent organization. The company is fiscally sound and enjoys a high degree of customer retention. In addition to our manufacturing capabilities, we also offer many Value Added Services.